1. Blitz the chopped onion in a food processor until pretty much puréed. Heat the oil in a large saucepan over a medium heat. When hot, add the onions and cook them, stirring regularly, for about 10 minutes, by which time they should be browned. 2. Add the cardamom pods, cinnamon stick, garlic and ginger and continue to fry over a medium heat for 4-5 minutes, again stirring regularly. 3. Sprinkle in the dried spices and fry for 30 seconds, stirring almost constantly to stop them from burning. Pour in the coconut milk and allow to come up to the boil. Simmer the liquid for 2 minutes. 4. Drop in the chicken pieces along with a generous pinch of salt and pepper and stir everything together. You should have enough coconut milk to submerge the chicken – if not, pour in a little water. Cover and simmer the ingredients for about 10-12 minutes, by which time the chicken should be fully cooked through with no pink meat. 5. Finally, stir through the ground almonds and desiccated coconut along with a splash of water if the sauce is too thick. 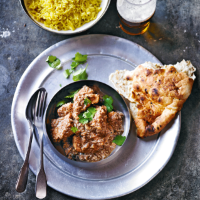 Serve up your korma topped with chopped coriander.